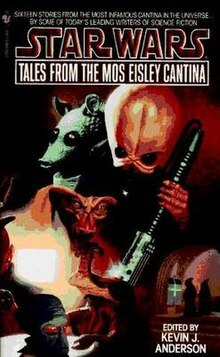 Tales from the Mos Eisley Cantina (1995) is an anthology of short stories set in the fictional Star Wars universe. The book is edited by Kevin J. Anderson. It is based on characters seen in the Mos Eisley cantina, a shady bar filled with aliens that was first shown in the 1977 film Star Wars. This page was last edited on 3 December 2018, at 18:50 (UTC).